Life Outside the Shell: What's your number? The scale, measuring tape, checking account, business profit & loss, facebook friends, Twitter followers, Instagram followers, shoes, bench weight, mile time, age, anniversaries. What do all these things have in common? Numbers. I am a numbers girl and I can see numbers in everything. However, I don't believe you have to love numbers to see numbers in everything. For example, how often do we step on the scale and see our "number" and claim that as our identity? Or how about looking in our checking account and claiming that as our identity? Maybe we compare ourselves to others our age and think "wow if I only my numbers matched theirs then I would be somebody". The truth is that you are not just another number to God. He doesn't care about the number on the scale, how much money we have, how many Facebook friends we have or how long we have(or haven't) been married. He cares about us and our story. Your story matters to Him. It matters so much to Him that he gave his one and only son so that you and me could have a relationship with him and share our story. 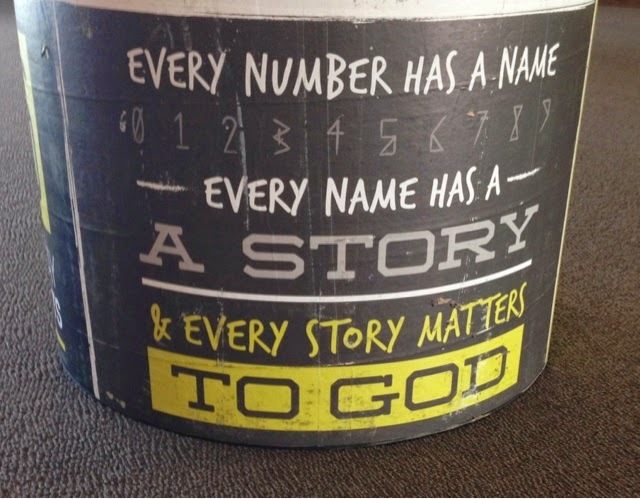 So next time the enemy comes to you and tries to get you to believe that unless your "numbers" look a certain way than you have nothing to give, remind yourself of this: I have a name and a story and it matters to God. YOU are the ONLY one who can share your story. Don't ever discount your value because of your postion in life. The power to share your story lies with you. You are valuable, you are loved and your story matters. I leave you with a passage from Luke 15:3-7 "Then Jesus told them this parable: Suppose one of you has a hundred sheep and loses one of them. Doesn't he leave the ninety-nine in the open country and go after the lost sheep until he finds it? And when he finds it, he joyfully puts it on his shoulders and goes home. Then he calls his friends and neighbors together and says, 'Rejoice with me; I have found my lost sheep.' I tell you that in the same way there will be more rejoicing in heaven over one sinner who repents than over ninety-nine righteous persons who do not need to repent." God loved us enough to come after us. Now we must stop letting our numbers control us and instead use our number, or story, to go after the other lost sheep! Really love this. Been struggling with numbers my whole life. I am not the sum of my numbers. I love this. I've been really good lately at not letting myself be defined by numbers. It is hard, but I am working on it, and God is always helping. Awesome Rachael! Great, timely reminder, thank you!